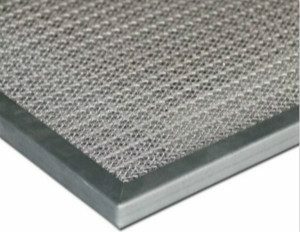 Metal mesh filters are pre filters, they are excellent alternative for a variety of HVAC application. Our metal mesh filters are made of multiple layers of pleated and flat aluminum screen media,that allows for easy capture of particulates. The filters are non-corrosive and pass the salt spray test, they are excellent at excellent at removing airborn moisture droplets in combination with dust particulate during high moisture environments. Our metal mesh filters are easy to clean and they are reused for quite a long time. Because they can be washed and reused, these filters last several years before they need replacement. This saves money on filter replacement costs. We started at year 2006 and we have much experience to design and make metal mesh filters per request,our metal mesh filters can be used for a large variety of applications, both commercial and residential. They are used in air systems, room air conditioners, range hood fans, roof units, air exhaust, etc.Our metal mesh filter can be used to filter item in water flow.,please kindly contact us if you have interest.